The Cleveland Browns came into the 1993 NFL season after having endured three straight losing records. Under third-year Head Coach Bill Belichick, the Browns were showing signs of steady improvement and were active in signing free agents during the offseason. One of those newcomers was QB Vinny Testaverde, once a first-overall draft choice who had spent six uneven years in Tampa Bay. He was brought in to back up the team’s popular but brittle star quarterback, Bernie Kosar, who oddly enough Testaverde had understudied for two years at the University of Miami. With a healthy Kosar behind center, Cleveland had gotten off to a 2-0 start in ’93. On September 19 the Browns took on the Raiders at Los Angeles. The Raiders were also 2-0 under Head Coach Art Shell. They were coming off a disappointing 7-9 record in 1992 after having been a playoff team the prior two years and had also brought in a new free agent quarterback, ex-Giant Jeff Hostetler. The veteran club had many aging players, but DE Howie Long was still outstanding and WR Tim Brown and CB Terry McDaniel were solid talents. There were 48,617 fans in attendance at the Memorial Coliseum. The Raiders started off with an 80-yard drive that took eight plays and benefited from a 26-yard gain on a pass to WR Alexander Wright in a third-and-ten situation from 38-year-old backup QB Vince Evans, who came into the game when Hostetler was injured while being sacked. Hostetler returned and finished off the series with a two-yard touchdown throw to TE Andrew Glover. 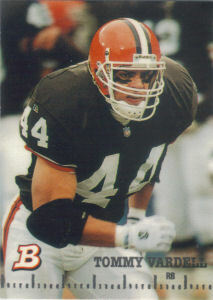 The teams traded punts until late in the opening period when Kosar was intercepted by DT Chester McGlockton, giving the Raiders the ball at the Browns’ 7. They weren’t able to punch in for a TD, however, and settled for a 24-yard field goal by Jeff Jaeger to make it 10-0. Following another Kosar interception on the last play of the first quarter, LA added another Jaeger field goal, this time from 27 yards. That was it for the first half scoring as Cleveland was only able to generate 37 net yards and three first downs while the Raiders failed to put more points on the board when they had opportunities. McGlockton and Howie Long dominated the line of scrimmage and harassed Kosar throughout the first thirty minutes. Neither offense was effective in the third quarter until Cleveland RB Tommy Vardell took off for a 54-yard gain to the LA 24 yard line. But the Browns moved backward rather than forward as Kosar was sacked for a nine-yard loss, Vardell lost two yards on a running play, and Kosar fumbled and lost three more yards on the recovery. Cleveland was forced to punt. Late in the period, and following another punt by the Raiders, the Browns moved into Los Angeles territory again thanks to a pass to Vardell that gained 21 yards, but the fourth quarter opened with Kosar, under heavy pressure, being intercepted on a pass at the goal line by Terry McDaniel. When the Browns got the ball back after another three-and-out possession by the Raiders, Testaverde was in to relieve Kosar. Taking over at his 33, the ex-Heisman Trophy winner completed passes of 11 yards to TE Brian Kinchen, 18 yards to WR Lawyer Tillman on a third-and-seven play, and 15 yards to WR Mark Carrier, who had been a teammate previously with the Bucs. The drive stalled at the LA 14, but Matt Stover kicked a 32-yard field goal and Cleveland was finally on the board. Once again the Raiders failed to move the ball on offense, but two plays after Jeff Gossett’s punt, CB James Trapp intercepted a Testaverde pass to once more put LA in possession in Cleveland territory at the 38. Three plays netted three yards, but Jaeger kicked his third field goal of the game from 53 yards to give the Raiders a seemingly-secure 16-3 lead with five minutes remaining in the game. 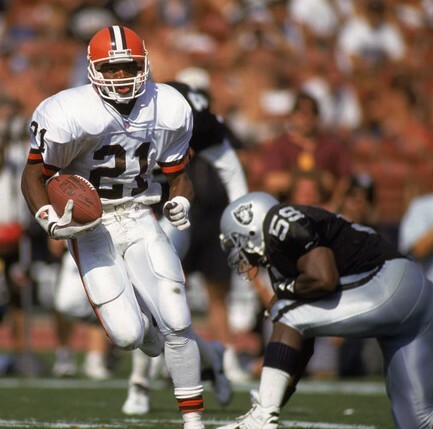 It seemed even worse for the Browns when RB Eric Metcalf fumbled the kickoff and, while he recovered, the offense had to start at its own 10 yard line. However, Testaverde again began completing passes – 17 yards to Carrier on first down, 13 yards to RB Leroy Hoard on a second-and-ten play, 22 yards to Metcalf for a big third-down conversion, and 18 yards to WR Michael Jackson. Testaverde was sacked after Cleveland got inside the LA 10, but responded with a 12-yard touchdown pass to Tillman that capped the 12-play, 90-yard series. With Stover’s successful extra point, the Browns were down by 16-10 with 2:26 remaining on the clock. The Raiders took possession following the ensuing kickoff deep inside their own territory and, following an outstanding play by Cleveland LB Pepper Johnson to prevent Hostetler from completing a third-down pass to Glover, Gossett ran out of the end zone from punt formation to take an intentional safety. Metcalf returned the free kick for 37 yards to give the Browns good field position at the LA 45. Vardell ran for eight yards and, after Testaverde’s pass intended for Jackson was incomplete, three more yards and a first down. Testaverde threw to Carrier for 16 yards to the 18 yard line and, after spiking the ball to stop the clock, passed again to Carrier for 17 more yards to put the ball on the one with 11 seconds remaining. The Browns used their last time out and Testaverde tossed an incompletion. On second down, Metcalf took a pitch and ran around end for a touchdown and the Browns could celebrate. Cleveland came away with a dramatic 19-16 win. “I’m physically and emotionally shocked,” said a disappointed Howie Long afterward. In a game dominated by defense, the Browns outgained the Raiders (316 yards to 156), who only had 85 net passing yards. Cleveland also had more first downs (20 to 11). However, the Browns turned the ball over four times, to none by Los Angeles. Cleveland recorded six quarterback sacks to LA’s five and the teams combined for a total of 14 punts. Bernie Kosar had been dismal, completing 8 of 17 passes for 71 yards and tossing three interceptions. Vinny Testaverde, in less than a quarter of play, was successful on 10 of 22 throws for 159 yards with a touchdown as well as an interception. Tommy Vardell rushed for 104 yards on 14 carries – noteworthy because it was the first hundred-yard rushing performance by a Brown in 70 games, covering five years. Mark Carrier caught 5 passes for 73 yards. For the Raiders, Jeff Hostetler went to the air 25 times and completed just 11 for 94 yards and a TD, although with none picked off. RB Greg Robinson was the top ground-gainer with 59 yards on 18 carries. FB Steve Smith paced the club with 4 catches for 42 yards. While all the right assurances were made in the immediate aftermath that Bernie Kosar was still the starting quarterback, he was soon supplanted by Testaverde and, in a shocking move, was waived at midseason – especially shocking because Testaverde was injured at the time and third-stringer Todd Philcox had to step in. 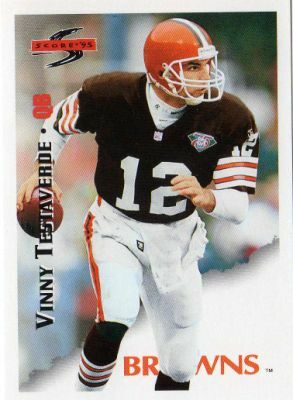 The Browns, after having gotten out to a 5-2 start, ended up on the wrong side of .500 again at 7-9, but Testaverde finished up as the starting quarterback with his best year to date in the NFL. He completed 56.5 percent of his passes for 1797 yards and, for the first time, tossed more touchdown passes (14) than interceptions (9). The stage was set for improvement in 1994. Eric Metcalf (pictured below) was a consensus first-team All-Pro and Pro Bowl selection as he gained a league-leading 1932 total yards (611 rushing, 539 receiving, 464 returning punts, and 318 returning kickoffs). Tommy Vardell rushed for 644 yards on 171 carries (3.8 avg.) – the 104-yard game against the Raiders was the only hundred-yard rushing performance of his career. The Raiders recovered to go 10-6, finishing second in the AFC West but earning a spot in the postseason as a Wild Card. They made it to the Divisional round before losing to Buffalo.